When I returned from India on Wednesday I came down with some bug that, shall we politely say, required me to visit the toilet an above average number of times! I went to the Velodrome on Thursday evening with North Cheshire Clarion and didn’t feel especially great, and I felt terrible on Friday at work. On Saturday morning I did a 24 mile club run on my new singlespeed Langster Steel and I felt better. During the afternoon and evening I deteriorated and so when I got up this morning I really should have made the sensible decision not to attend the Bill Bradley Memorial Ride, staged by the Southport Cycling Club. However, as Liz my wife would say, I’m a typical male and a typical Hughes and therefore hauled myself out of bed, via the toilet, and into the car to set off for Preston Arena. A brief queue to sign in (I’d pre-entered) and pick up a goody bag (containing bottled water, banana and a muesli bar) and I was good to go. I left Preston Arena following another couple of riders. We’d been given an audax-style route sheet so I was a bit nervous about the route as when we do audaxes we tend to rely on Andy from NCC for directions! I was on my own today – nobody from the club seemed too interested in the event. Hopefully I can change their minds for next year. As for the route, I needn’t have worried as it was signed perfectly at every junction with large black-on-yellow arrows. I caught up with a large peloton before long and it soon grew to between 30 and 40 riders, including some of Southport CC’s younger members. Riding in such a large group gave an immediate benefit in terms of the tow I was receiving. The hum of the tyres of such a large group is really impressive – almost vuvuzuela standard! Early on we went past a farm entrance – the road was covered in a slippery liquid cow-dung. Not nice in such close quarters (no mudguards) but behind I heard the sounds of a crash and it seems the wheels of one of the younger guys went from under him and down he went. He was okay, although I guess he didn’t smell too good! The guys at the front set a cracking pace, doing the first 20 miles in a little over an hour. I was relatively comfortable at this point as the route started a gradual climb. I dropped off the peloton at about 25 miles as I stopped to take off my jacket and arm warmers. At 30 miles we hit the first of 3 big climbs. This is Jubilee Tower in Quernmore, which is climb 76 in Simon Warren’s 100 Greatest Cycling Climbs book. It’s rated 6/10 and is between 2 and 3 miles long, depending on where you start counting. This was the point where I realised I had nothing in the tank. I’m normally good at climbing, having put a serious amount of training in for my LEJOG, but the number of riders who just went past me like I was stood still was embarrassing. I was blowing hard, sweating massively more than I usually do and my legs felt completely dead. My heart-rate was in zone 5 for the majority of the climb, hitting 184bpm at one point. I took some food at the top but I was really struggling at this point. I was still sweating and my stomach was cramping – not a nice feeling at all. A bit of respite on the downhill and a bit of flat through the beautiful Trough of Bowland, which brought back happy memories from my childhood – it was a favourite place for us to visit. Then we climbed up the hill out of the trough which was the second big climb. This one I found slightly easier but I was still struggling way more than usual. This is the reverse of climb 75 in Simon Warren’s book and so we descended at a rapid pace. It’s a twisting descent with a drop on one side and a ditch on the other, as I approached the bottom I could see several riders from Southport CC stopped and somebody on the road. One of the lads had either overcooked it or had a mechanical (different stories later) and had come off. He looked in some pain, possibly his ankle. I stopped to see if they needed any help but they’d already sent two riders off to get a mobile signal and ring an ambulance. I continued the descent in Dunsop Bridge and stopped for a break at Puddleducks cafe. Still not feeling good I forced (seriously) myself to eat some coffee and walnut cake and have a cup of coffee. As I left the cafe, some Southport CC lads came in and I asked about the young lad. It seems he was air-ambulanced to hospital but was as well as could be expected. Coming out of Dunsop Bridge and through Newton took us up the longest climb on the B6478. Again I struggled up it but was rewarded with a long descent into Waddington where I hit 43mph. At this point I joined one of my LEJOG training routes which took us up a relatively short but steep hill at Chaigley. This hill has given me no problems in the past but again I was huffing and puffing up it, sweat streaming off me. 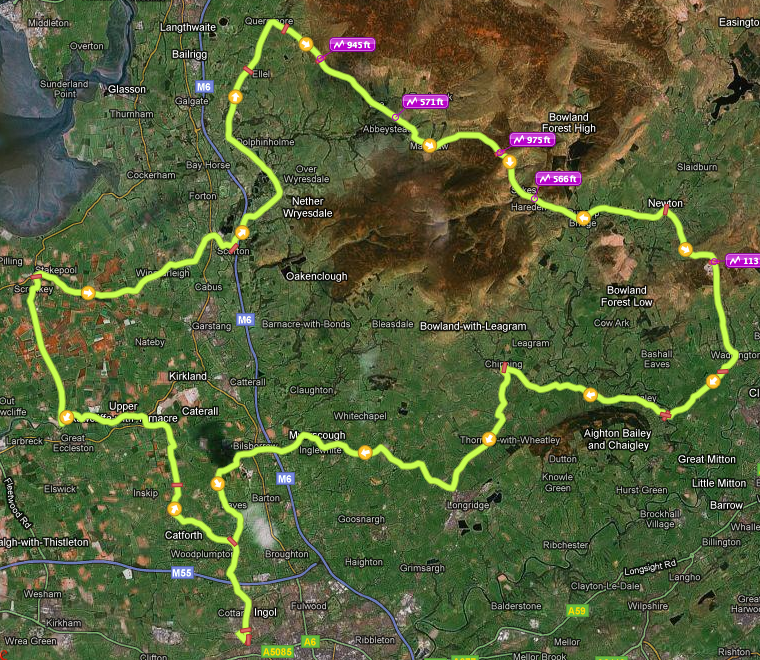 That took us to 56 miles and thankfully, the rest of the route was pretty much downhill, through Chipping and skirting Longridge, then through Inglewhite before turning back through Woodplumpton and back to the arena. At the finish there was tea, coffee, cakes, snacks and a certificate! All this, the excellent organisation and routing, goodie bag and parking at the Preston Arena was included in the £7 entry fee which puts the majority of sportives to shame. The route was fantastic – the countryside is really beautiful – and I just wish I was feeling better and could have enjoyed it more. Many thanks to Ken Beck and Southport CC for an excellent event. Finally, I heard the young lad may have broken his leg but was in good spirits. I hope he makes a full recovery. EDIT – update is that the lad had no bones broken. #lejog #kickcancer sponsorship update – over £13,000!!! Hi I'm Ade Hughes. This is my road cycling blog. Thanks for visiting, I hope you enjoy it and feel free to leave a comment.